The Glamour Of The "Oscar Moment"
The Academy Awards show is ridiculous. Guests arrive in broad daylight wearing the most formal of evening gowns. Presenters, including some of the world's most accomplished performers, read their lines with the studied cadence of high-school commencement speakers. In contrast to the Super Bowl, a beauty pageant or "American Idol," nothing happens on stage that affects the outcome of the competition. The production numbers are just padding. And, of course, the speeches are boring, the show is too long, and comedies never have a chance. Yet the Oscar ceremony somehow manages to be compelling. In a good year like 2010, its U.S. audience tops 40 million, according to Nielsen Co. In a bad year like 2008, it tops 30 million. By contrast, the recent Grammy ceremony, which offers far better musical numbers, won its week with only 26.7 million viewers. The Oscar show's appeal can't just be the fun of water-cooler criticism. You can get all the information you need for that from Twitter or the next day's newspaper. You don't need to sit through the awards ceremony. In fact, as the marketing efforts of the Academy of Motion Picture Arts and Sciences suggest, the glamour of the Oscars lies not in the movies the show ostensibly celebrates, but in the "Oscar moment." Watching the Oscars gives viewers the chance to imagine being singled out before the whole world as special, beloved and really good at their jobs. To promote the show, the Academy is giving fans in New York City two different chances to pose holding Oscars, either virtual statues or, at Grand Central Terminal, real ones. There, "the big payoff is that you get to go on stage and have your Oscar moment," says Janet Weiss, the Academy's director of marketing. Some people, she says, even show up in gowns and tuxes. Read the rest here. That's my photo to the right, taken on Friday in Grand Central. When I asked my Facebook friends to recommend photographers or stylists who could talk knowledgeably about hiding lamp cords, someone gave me a great tip: call Adam Fortner. An Austin-based stylist, Adam started on the editorial side of the profession, as the art director for Texas Architect magazine, later moving to Western Interiors & Design Magazine. In 2007, he founded Creative & Sons, which does photo styling of interiors and objects for editorial and commercial photographers, as well as art direction and production services. (He also has a cool blog, where you can find posts on subjects like decaying Victorian Lego houses and how stylists compose faux grocery lists.) We had such an interesting conversation, moving from lamp cords to other forms of styling magic, that I asked him to share some thoughts and experiences with DeepGlamour readers. DG: How is styling interiors different from being an interior designer? Adam Fortner: An interior designer creates spaces that are functional, and we show them off. The main difference is in the format our work takes. An interior designer creates a space that is meant to be experienced in three dimensions. The photographer and stylist’s job is to take that three-dimensional, fluid space and present it in a two-dimensional static photograph within a limited frame. Everything we do serves the photo, which can mean eliminating or moving things so they look best on camera, not necessarily so they function in the space. I tell people you can’t live in a styled room: the chairs are all at odd angles and the coffee table might be three inches from the couch; but look at the photograph and it’s magically transformed from what you see around you. DG: How is a room different when it's been styled for a magazine photo shoot compared to the way it might look if the owner had cleaned it up for visitors? AF: For the most part we try to leave the room as we found it, but once we’ve found the angle and framing of the final photograph, adjustments have to be made. At that point a stylist’s job becomes editing. It might be a simple tweak to accommodate the perspective of the camera and show off one detail or another, or filling spaces that might have become visual voids in the frame, or even removing or adjusting things to avoid overlaps or add the appearance of depth. In some cases the accessories or pieces that the designer or client chose just won’t work for a photo and you have to change it. A dark, rich duvet cover may look and feel luxurious in person, but it may fall flat in camera. I am careful to reassure homeowners or clients that it’s not about their personal taste, it’s about the composition and quality of the photo. – Who wants their room photographed anyway so everyone knows what their stuff looks like? – They don’t photograph your stuff; they bring in their own stuff. – Well why don’t we just have them come in and finish the room? – Because if your stuff doesn’t look fabulous in the first place then they don’t want to come in and change it! DG: What's the purpose of styling a room for a magazine photo? What's the effect you're trying to achieve? AF: Styling is often called the “hidden profession.” A lot of people don’t know it is even a career, and in fact, to be good at it, that’s the whole point: not to be noticed. So you have to find a balance of studied naturalness. A lot of it is also about aspiration. You want to create a space that people want to be in, one that exemplifies the way people want to live, not necessarily the way they actually live. Honestly, how many people wake up to a vase of flowers, a cup of tea and The New York Times perfectly folded on their nightstand? DG: How does styling for architects differ from styling for interiors magazines or advertising? AF: The architect is creating or defining a space, so showing off their work takes a different form. Architects understand and experience spaces in a different way. For them, an open and unadorned space is beautiful in and of itself. They appreciate the clean lines, textures, and light in a room. When styling a space for an architect, you often only need minimal adornments, and what you do use really needs to highlight the architecture. That doesn’t always sell the public, though. Empty spaces can look cold and uninviting at first glance, and it takes a little more time and effort to see the details. A magazine or advertisement doesn’t have that luxury; it needs to grab a viewers’ attention in a split-second. I try to recommend this approach to architects. By creating images that capture people’s attention, they then have the opportunity to guide clients deeper into the details, and have a better chance of communicating their thoughts and ideas. DG: You've recently done some styling work for shoots done in photo studios rather than real interiors. How is styling different when you build from scratch? What does it teach you about styling in the “real world”? AF: I think of styling as storytelling. When you work in someone’s home, the story is already there. They’ve created their own world with their own tastes: their books, their art, their furniture; we’re mainly there to enhance and document it. When working in a studio, you’re starting with a blank slate. You have to create the entire story–start to finish–and the sky’s the limit so that allows you a lot more freedom. I’ve been working with an excellent production designer who has taught me so much about that. I’ve taken those lessons back to the houses I work on give myself a little more room to create atmosphere, especially when faced with more challenging, less engaging spaces. DG: When you see a photo of a room in a catalog or interiors magazine, do you think about how it’s been styled? What do you notice that a layperson wouldn’t? AF: I can’t look at magazines or catalogs without noticing how they’re styled. I hardly look at the products in catalogs. In fact, I’m usually looking at the objects that aren’t for sale. Similarly, in magazines, I’m looking for those small touches that give the space personality. I also look at not only what is in the photo, but also how it’s placed, and why that composition works. Glamour is a magic combination of confidence, beauty, and ease that create a whole greater than the sum of its parts. The word always conjures a flash of light in my mind’s eye… whether it be flashbulbs, the sparkle of a diamond, the sheen of beautiful fabric, or just that glint in the eye of someone at ease with themselves. But I also think that glamour is something ascribed, not inherent. Things are only glamorous because someone else thinks they are. Alexander McQueen. A very good friend of mine gave me a book of his work for my birthday, and while I knew of him and some of his work, I was impressed/amazed by the range and drama and sophistication of what I saw from start to finish. For basic survival glamour is a luxury, but like the fine arts, it’s an unknown quantity that can’t be measured or explained, yet somehow makes life more enjoyable. Auntie Mame . The interiors of her apartment are just amazing. In fact, it was those sets that got me interested in interior design. If I could pick just a scene from a movie, it would be the “Ascot Gavotte” scene from My Fair Lady . The amazing black-and-white dresses and hats against the simple, white, paper-like buildings (all dreamed up by Cecil Beaton) along with the stilted movements and poses are just brilliant. When I was working for a magazine in Los Angeles we hosted a tour of the Case Study houses in Pacific Palisades, which was amazing enough, but in the evening they opened up the Eames house and lit up the lawn with strings of lights. I stood there taking in the crisp night air coming in off the ocean and thinking that I never could have dreamed I’d be there, yet there I was. A Cartier Tank Américaine Flying Tourbillon watch. With a name like that, how can it not be glamorous? Not any one specifically, but an old house filled with lots of history. Is there a glamorous job? I think there are a lot of jobs that seem glamorous, but that’s because we don’t do them. If something looks easy and glamorous, it’s probably because there’s a lot of hard work behind it. Working in the publishing industry. Like before, it often gets glorified in movies and on TV, and really it’s mostly hard work. Yes, there are moments of fun and excitement—that happens anywhere when you love what you’re doing—but there’s also the other 90 percent of the time that you are working and planning and coordinating to make that moment happen. But even I forget that sometimes. 10) Something or someone that you find glamorous whose glamour is unrecognized. Space. Not the final frontier, but the absence of stuff. Space to do whatever you want: an empty room, an open field. It can be anything and everything. I didn’t know it was in danger! I think the world needs glamour, whether to embrace or rail against, depending on the mood, so it will be around for quite some time. I don’t think so. It’s something that you achieve, intentionally or otherwise. 1) Angelina Jolie or Cate Blanchett? 3) New York or Los Angeles? 4) Princess Diana or Princess Grace? 7) Art Deco or Art Nouveau? 8) Jaguar or Aston Martin? 10) Diana Vreeland or Anna Wintour? 11) Champagne or single malt? Diamonds. Can’t beat the sparkle. 14) Kate Moss or Naomi Campbell? 15) Sean Connery or Daniel Craig? As a word glamour is tricky to define. Whether any of us experience something as being glamorous depends on our individual responses. I find Charlize Theron’s hair and makeup wonderfully glamorous in the photo at left, while others may not. I feel certain that the intent was to create a glamorous photograph, but intending something to be perceived as glamorous does not insure we will all respond to it in that way. In dressing for the Oscars, Theron has made some choices that bombed with most fashion critics. Most people felt that the Christian Dior dress that she wore to the 2010 Oscars looked regrettable on her, and it made many worst-dress lists. The Christian Dior dress (shown at right) that she wore to the 2005 Oscars was panned by some as suitable for a high-school prom, but most loved it, and it has appeared on several lists as one the best Oscar dresses of the decade. When you see a large photograph of her making her entrance onstage in this dress, you can almost imagine that it was chosen knowing what the stage colors and design were going to be. The effect of the dress in relationship to that stage design is stunning. In a situation when something strikes us as stunningly glamorous, the archaic meaning of glamour as magic or enchantment still seems relevant. What we experience seems to cast a spell on us, and what we perceive seems like an enchantment. Even while under the spell, we may sense that what we are experiencing is in part a transient, artful conjuration, and that everything possible has been done to try to make us feel we are experiencing glamour at its epitome, fully incarnated. Small wonder this is so difficult to pull off—the slightest incongruity can break the spell of glamour. Oh, but what a delightful experience to have when the enchantment works as planned. The new issue of Reason carries a short item I wrote about politics and glamour. A regular Reason feature, the assignment was to come up with a short, three-item list. It’s not online yet, and the published version was a bit truncated for reasons of space, but here’s what I originally wrote, complete with links not available on paper. 1. Glamorous political figures are rare. Unlike charisma, glamour isn’t a personal quality a politician can possess. It’s a product of imagination that requires mystery and distance, which are hard to maintain in a political environment that prizes familiarity and full disclosure. Glamour also tends to dissipate once you’re in office and have to take specific positions, thereby disillusioning some of your supporters. See Barack Obama. 2. Glamorous policies are common. As a nonverbal form of rhetoric, glamour is one of the most common ways of selling policies, from single-payer health care to the abolition of the income tax — not to mention countless military actions, perhaps the oldest use of glamour in politics. My favorite recent examples, because of the alluring imagery involved, are high-speed rail and wind energy. 3. Political glamour is most seductive when it’s selling systems that promise an escape from complexity and compromise. Whether expressed in full-blown communism, Western European socialism, or American technocracy, the glamour of top-down planning shaped 20th-century politics. F.A. Hayek lamented classical liberalism’s lack of similar Utopian inspiration but, in fact, Ayn Rand was masterful in her use of glamour. She knew not only how to tell a romantic story of struggle and triumph but how to create glamorous snapshots that focused her audience’s yearning for freedom and fellowship. Hence the persistent, if illusory, appeal of recreating Galt’s Gulch [link added for DG] in the real world. After being dumped by the History Channel and scorned by other skittish networks, The Kennedys miniseries has found a home after all, on the little-known ReelzChannel. The WaPo's Lisa de Moraes has an amusing report. Buried in The Hollywood Reporter's original article on History's decision to scuttle the show was the news that, in exchange for its discretion, one of the network's parent companies might get access to rare recordings of Jackie Kennedy's voice. Caroline Kennedy has a book deal with Disney's Hyperion publishing division, which announced in April 2010 that it will publish a collection of previously unreleased interviews with the late Jackie Kennedy timed to the 50th anniversary of the first year of JFK's presidency this fall. Caroline has agreed to edit the untitled book, write an introduction and to help promote it, including making an appearance on Disney/ABC's Good Morning America, among other outlets. As part of the promotion for the book, Caroline is expected to reveal some of the 6.5 hours of previously unheard audiotapes of the former First Lady that form the basis of the book. Had the History Channel not bowed to her influence, their mother company would have likely lost out on an another Kennedy venture; a volume containing six and a half hours of hitherto-secret interviews that her mother, Jacqueline, did with worshipful historian Arthur Schlesinger Jr. in 1964. The audio book, due out in September, will let you hear Jackie speak in her breathy, Vassar voice about her husband's early campaigns, the Cuban Missile Crisis and “married life in the White House,” according to Hyperion Books. The Kennedys' glamour is an important income-generating asset, so I, too, doubt we'll be hearing anything revealing. But we will hear something, which in itself is unusual. One of the world's most photographed women, Jackie mostly let her carefully crafted image speak for her. 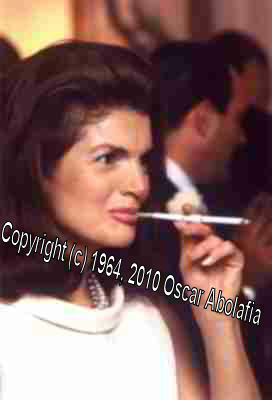 (Here's a rare photo of Jackie smoking.) Only a few public traces of her voice remain, most of them from the 1960 campaign or White House years. And unlike the graceful photos, they seem dated, calculated, and a little strange. The most famous, featured at the top of this post, is her White House tour, broadcast on CBS. There she speaks in ingratiatingly tones, masking the fact that she's didactically instructing both her interviewer and the general public, who don't share her high-end taste or her knowledge of decorative arts. By contrast, when interrogating Dr. Benjamin Spock in a 1960 campaign ad, she plays a subtly flirtatious, slightly dim student. In another campaign video, introduced by Myrna Loy, she acts the normal American wife and mother, just like the women watching. "Now I think politics is one of the most rewarding lives a woman can have--to be married to a politician," she affirms. New recorded interviews promise to undercut Jackie's mystery. Because the recordings date from 1964, when she was still playing the perfect husband's perfect widow, they also threaten the new post-feminist image crafted for her in the recent books focusing on her publishing career.